PRINCE GEORGE, B.C. -- Service technicians from Babine Truck and Equipment of Prince George, B.C. have earned first place at the 2012-2013 Volvo Trucks North American Vista World Championship semi-finals. (From left to right): Tyler Kronebusch, Dan Orser, Clarence Oosterhoff and Matthew Giesbrecht from Babine Truck and Equipment of Prince George, B.C. earned first place at the 2012-2013 Volvo Trucks North American Vista World Championship semifinals. PRINCE GEORGE, B.C. — Service technicians from Babine Truck and Equipment of Prince George, B.C. have earned first place at the 2012-2013 Volvo Trucks North American Vista World Championship semi-finals. Conducted every two years, the competition recognizes technician excellence among Volvo dealer service personnel. By finishing first, Babine Truck and Equipment claims a spot among the best 32 teams in the world and will compete at the VISTA World Finals June 25 in Gothenburg, Sweden. Members of the winning team – Tyler Kronebusch, Dan Orser, Matthew Giesbrecht and Clarence Oosterhoff – out-performed 208 other teams representing Volvo dealers across North America. All four members of the Babine team are Volvo Master Technicians, the highest level of certification for service technicians. Master technicians typically have more than two years of work experience, more than 115 hours of training and have completed a series of tests to achieve and maintain the status. The 2012-2013 Vista competition – which stands for Volvo International Service Training Award – began in August and included three rounds of online competition involving technical questions. The field was narrowed to five teams of finalists from the US and Canada which travelled to Volvo Trucks’ North American headquarters in Greensboro, N.C. for the final round. The other finalists represented M & K Quality Truck Sales from Byron Center, Mich., Burr Truck and Trailer Sales of Vestal, N.Y., Truck Enterprises from Harrisonburg, Va. and Mobile Fleet Service of Yakima, Wash. 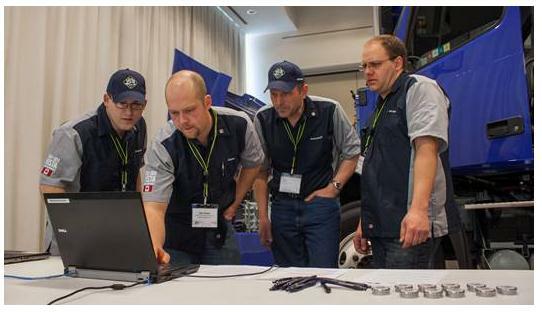 In Greensboro, the finalists were tested on their knowledge of service and parts literature and ability to look up parts and service information within the Volvo system. Contestants also had to troubleshoot pre-determined faults placed on two Volvo trucks and a Volvo D13 engine. Volvo officials note that participation in the competition requires a significant dedication of time and effort, with each of the five finalist teams investing up to 34 hours of additional service training throughout the process. This year’s competition was the largest yet, with a 70% increase in dealership participation compared with the 2011 event. The biennial Vista competition began as a national event in Scandinavia in 1957 and expanded to a global event in 1977. The competition is open to all aftermarket employees in the service network. This year 16,710 people forming 4,391 teams from 93 countries participated worldwide.